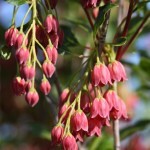 An upright shrub with hanging clusters of bell-shaped cherry red flowers in the late spring. 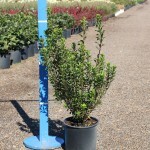 The summer foliage is medium green. Colors in the fall to bright red and oranges. It needs moist, acidic, well-drained soil. The fall color is brightest in full sun, although the plant will tolerate some shade.